This awesome Jungle Adventure is one inflatable that�s a must at your next event. This party pleaser gives non-stop safe inflatable fun. 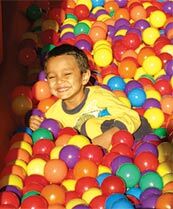 Children can climb, slide, bounce and play in the colorful ball pit. This inflatable is an attractive and cleverly designed to allowing many activities in one unit! The Jungle Adventure 4 in 1 Mini Combo will rent fast, so book early for this sure fire winner! It even comes with a special safety door that can be secured from the outside. This unit is great for the little ones at your next event! It can even be set up in a two car garage for those cold and wet days. This unit 13' L x 15' W x 7'10" H. For that extra peace of mind Magic With A Twist sanitizes the ball pit balls after each rental. This unit is suitable for ages 3 to 6 years. The Jungle Jump 4 in 1 combo requires a relatively flat area about 18� x 20' and within 100' of an electrical outlet. This unit has a weight limit of 100 pounds per child.